Maybe being a perfect parent isn’t such a good idea…. 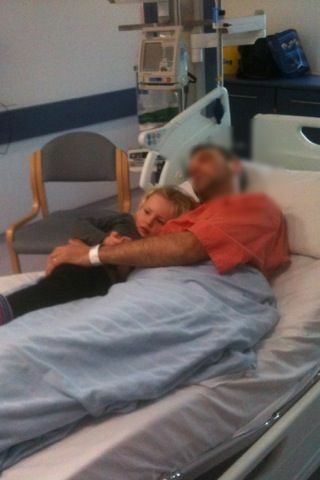 Do I take my daughter to see her daddy in hospital? This was a question I struggled with recently. As many of you are aware my husband was involved in a road traffic accident and sustained substantial head injuries; not a phone call any loved one ever wants to receive late on a Friday night. However, he is expected to make a full recovery after giving us all quite a fright. Coincidentally, as I was whiling away time in the hospital, reading yet another trashy newspaper, I came across an article, but for the life of me I can’t remember the woman’s name. However, she grew up in the 70s in the perfect house on a perfect street with perfect parents. Growing up she didn’t know a single person with divorced parents! She was never exposed to any of life’s challenges and now as an adult she’s unable to cope with further education, relationships, work and now being a parent. Ironically, in a time when people wear a bad upbringing as a badge of honour, she blames her ‘perfect upbringing’. As an adult, I feel I’m quite good at dealing with difficult situations as I was given the opportunity as a child/young adult. My life hasn’t been anymore difficult than anyone else’s, I’ve experienced death, divorce, disappointment and disease, but my mother never sheltered us from these situations when they happened. However, she was always careful with the amount she did share, telling us just enough to put us at ease. From the beginning, I was honest with my 4 year old and told her that ‘daddy had fallen off his bike and bumped his head and would need to stay in the hospital for awhile’. After a couple of days they both started asking to see each other and I was really torn. Do I take her or don’t I take her? On the outside she seemed okay, but I could tell that she was worrying as she was a bit quieter than usual, which may be because the last two people she visited in hospital died. In the end, I decided to take her. A friend suggested that the best thing to do was to prepare her first. My friend kindly sent me a photo of her own son; one with a black eye and another a few weeks later with it healed. I showed these to her on the train, explaining that Daddy looked different but in time he would be heal. When we arrived she was very quiet and I slightly panicked that I made the wrong decision, but within minutes she climbed into bed with him, they shared a much needed cuddle and quickly began arsing around with the bed controls laughing and carrying on as usual. Phew! When we got home she did say that she ‘was scared when she first saw him’ but I could tell that a giant weight had been lifted off her little shoulders. Ooh, that just made me cry a little bit! Although difficult, it seems the right decision, they both obviously needed a cuddle and, if anything as you said she’ll know that not everyone who goes to hospital dies. I think I would take my kids if in your situation, perhaps not straight away but, like you said, if they were worrying at home that Dad had gone forever the seeing him poorly can’t be worse that not knowing! What a tough decision. I don’t know what I would have done, probably similar to you. Kids do tend to be more accepting than adults. Lots of hugs x I think you done the right thing. When I had an operation, my fiance took our daughter to see me and she was very quiet but she got some new toys so she was happy. I took my daughter to see my dad who has been quite ill in hospital. It made him feel better and again she was quiet but had a balloon and a CBeebies magazine! I live away from my dad so I felt that it was important for him to see her and vice versa. He was sitting up and talkative so we didn’t see him at his worst. My daughter is two so maybe a bit young but I feel that I made the right decision. My daughter may have to have a small operation soon so I think her visiting people in hospital will make her more settled when and if she is there herself. I think you handled it brilliantly. I would take my children. They have been to see my Mum several times when she has been in Hospital and they both went to say goodbye to my Gran just before she died. For us it’s just something that happens in life. Your beautiful photograph says it all. You made the right choice and handled it in exactly the right way. I would have done the same thing, and prepared them like you did. My kids have actually been to the hospital many times over the yrs, so now older they easily volunteered to sit with their very young Aunt while she underwent chemotherapy. Kids are a lot stronger than we think and I am sure it also helped with your husband’s recovery. I am happy to hear that all will be well in the long haul. I would have taken my children too – in fact, I did take them when hubby was in hospital AND when my mum was in hospital. IMHO it does them good to know that the world isn’t perfect all the time. I would have taken her too. I think as a parent you know, if your child is ready for it and I think it might help both your husband and your little girlie. She knows that her daddy will be fine and for your husband it was great to see his little one – welcome distraction from the boring day to day routine in hospital. Exactly the same – you have to imagine what their fears are and allay them, but let them see that the world is not perfect, but that we cope and move forward. I would have done exactly the same. And judging by her reaction you got it spot on. Sometimes the unknown can be even worse and she might have started to imagine that maybe he wasn’t coming back at all. You know how kids’ minds can work overtime. I hope she feels more settled with it all now and you’re husband is continuing to recover. What a nightmare for you all.